Finally, a one piece gas bottle storage cage is now available which means there are no more extra charges for lost components. Gas bottle cage hire means you can keep all your chemicals and gas cylinders secure and adhere to health and safety regulations at a cost that won’t dent your pocket. Robust galvanised construction with two secure padlock lugs. Stacks with forklift skids attached to the base. Easy to erect and folds flat for transport. If you are using gas bottles and chemicals then safe storage is a must. Gas cylinder storage hire is an affordable way to keep chemicals safe and it deters theft. The cages come as one complete piece which means there is no chance of losing parts or bits going missing on site so you can rest assured that there will be no hidden extra payments. This robust galvanised construction, which is secured with two padlock lugs, is easy to manoeuvre into position – it stacks with forklift skids attached to the base. The gas cage is simple to erect and folds flat for transport making it versatile and a flexible piece of kit. The gas cage is so easy to assemble you can learn how to do it just by watching a short video. Theft from building sites and vandalism is becoming a real issue and with the cost of raw materials climbing, scrap metal is often a target. Having a gas cage that can’t be dismantled even when it’s disassembled is a firm deterrent to the opportunist criminal. Potentially dangerous chemicals can be lethal in the wrong hands which is why it is essential to make sure that gas cylinders and other chemicals are properly stored at all times. 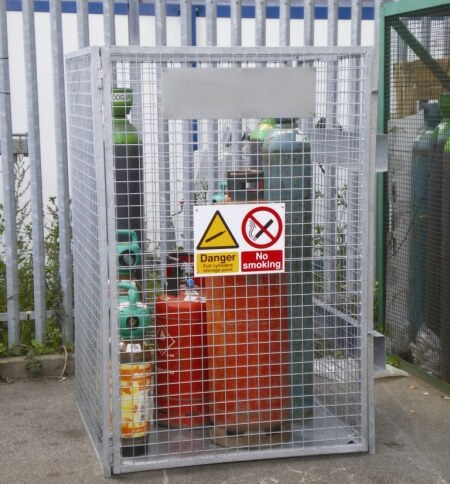 The gas cylinder cages available for hire measure 1200mm x 1200mm x1800mm so there is plenty of space for safe storage. Gas cage hire is easy. Call Lakeside-hire for further information and your chemicals and gas cylinders can be safely under lock and key next-day guaranteed. Minimum Hire period on this item is 2 weeks.